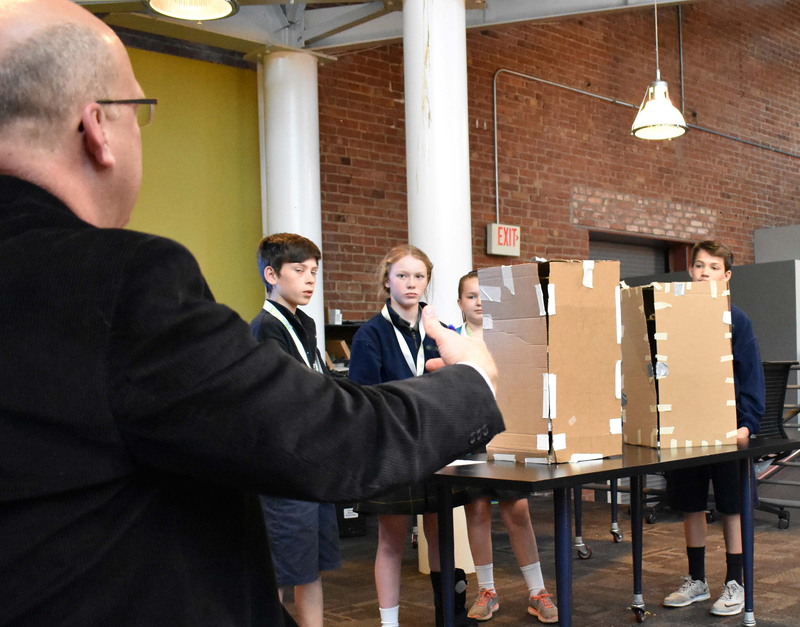 STEAM Studio: What Happens When Innovative K-12 Learning is Embedded Amongst Designers? | whitespace. 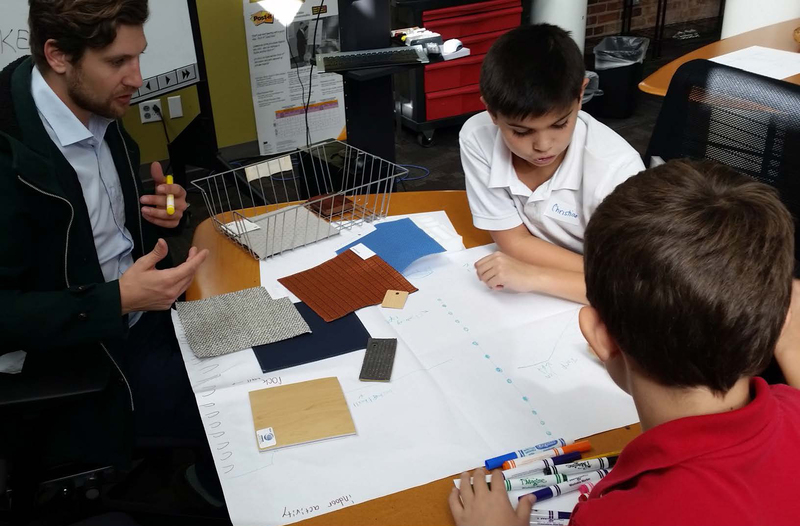 STEAM Studio: What Happens When Innovative K-12 Learning is Embedded Amongst Designers? As an educator, have you wondered how you could increase student engagement in your classroom? OK … let’s say, increase student excitement! Have you struggled with managing the various learning styles and personalities among your students? Have you felt stuck in a rut with the teaching and learning methods that work in your classroom? At STEAM Studio, we wonder about these things too. And in our experimental learning space, we have the freedom to explore new approaches – to offer student learning programs and professional development for faculty that allow us to share our love of building passionate, self-directed, lifelong learners and inspired teachers. We practice a number of innovative teaching and learning methods – proven to engage students of every learning style and ability. We do this while embedded in an architectural office – a place filled with creative design professionals that are both role models for the students to see creative processes in action, and coaches that bring architectural design processes to the students. Gould Evans architects volunteer personal time, as well as company time, to work with the STEAM Studio students (Image credit: Gould Evans). The outcomes, many of which are described in our recently published book, have been extraordinary. These positive outcomes have straddled all grade levels from Kindergarten through 12th grade, and crossed the socio-economic spectrum, from low income to affluent. So what’s different? A lot! In STEAM Studio, Design Thinking becomes the driving methodology for learning. It’s a process that helps students develop empathy skills and expertise in observation. There are no right or wrong answers as they interpret unmet needs and develop ideas for new solutions to improve a given situation. They’re encouraged to experiment – in which failure is an expected part of the process. They develop grit. And finally, they’re expected to communicate their ideas to authentic audiences – the pitch. For no idea becomes a great idea without a great pitch. Design Thinking is a process that helps students develop empathy skills and expertise in observation. (Image credit: Standford’s Design School). STEAM Studio also benefits from a collaborative teaching/coaching model. Dr. Mandi Sonnenberg, Professor of Education at Rockhurst University, serves as Director of STEAM Studio. She oversees all instruction. Her college students, training to become teachers, serve as coaches, providing hands-off guidance to the young learners. And high school students from several partner schools serve as mentors, bringing their own knowledge of coding, 3D printing, and robotics into STEAM Studio. Thus, there’s a transference of knowledge at a variety of levels that is quite unique. And learning happens in both directions, with the coaches and mentors learning back from the young students they’re helping. All the while, these coaches and mentors are fulfilling service requirements and receiving valuable practicum experience toward their future career development. 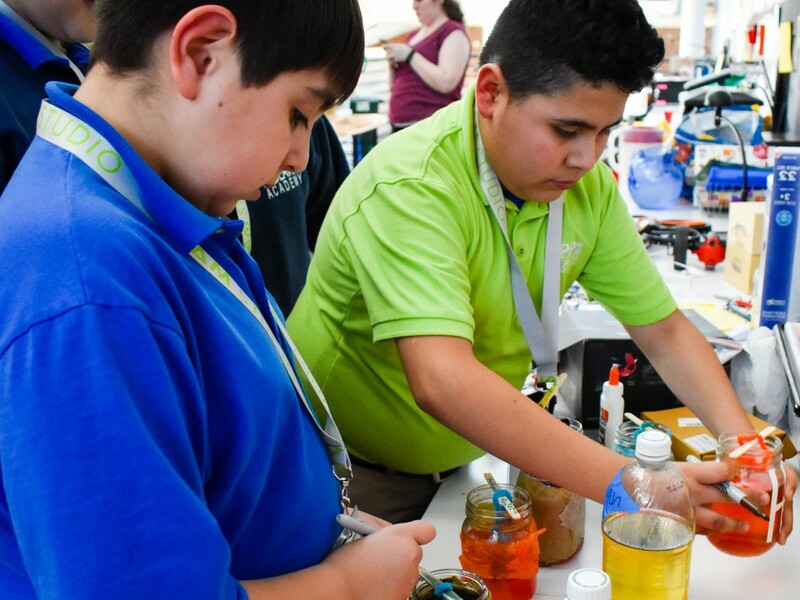 STEAM Studio also benefits from engaging students with business partners – creating relevance in their learning through engagement with professionals in fields of engineering, manufacturing, software development, and more. Beyond the students’ insights into these prospective career fields, they gain valuable soft skills helping to develop their career readiness – how to communicate with adults and conduct themselves in a professional setting. And they develop relationships, beginning to grow their professional networks well before they get out of high school. Learning in a professional work setting allows STEAM Studio students to develop valuable soft skills, which help to develop their career readiness (Image credit: Gould Evans). Perhaps most valuable, is students’ experience working and learning in a professional environment. From the moment they walk in the door, students feel a heightened sense of accountability for their behavior. They’re quieter. They’re engaged in their work. They’re inspired to create and take risks with their projects. Many have never stepped foot in a professional environment. And for a few, they suddenly see a future career opportunity they’d never before thought possible for themselves. It’s life changing! In our third year of operation, STEAM Studio has developed a robust set of student programs and professional development opportunities. Our mission is to inspire teachers and students everywhere – to plant seeds that prosper well beyond the walls of STEAM Studio. Our team will be elaborating on the successes and opportunities offered in STEAM Studio at the upcoming EDspaces conference, being held in Kansas City, October 24-27. Our programs have instilled inspiration and practical methods in dozens of teachers and hundreds of students across the region. Join us at 11:30am on October 26th to hear more about how STEAM Studio can reinvigorate your school’s learning culture, and inspire your faculty. Sign up now for the conference – doing so will also offer you the privilege of hearing two amazing plenary speakers; Sir Ken Robinson, author and education futurist, and Jaime Casap, Google’s Education Evangelist. Want to learn more on the STEAM Studio? 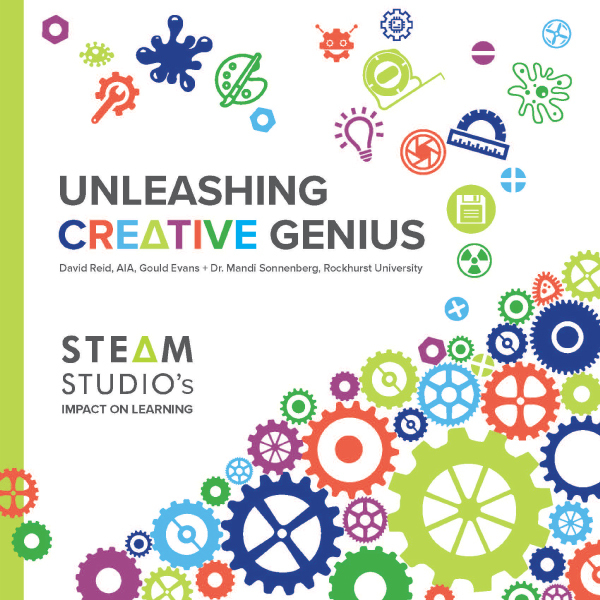 Grab our book – Unleashing Creative Genius – online at Barnes & Noble!